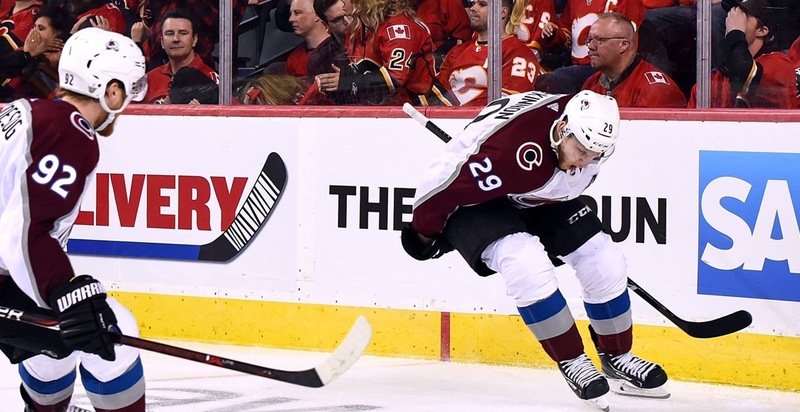 In a thrilling game, it was Colorado Avalanche’s Nathan MacKinnon playing the role of spoiler in Calgary on Saturday. MacKinnon tallied his first goal of the postseason at the 8:27 minute mark in overtime to lift his Avs to a 3-2 victory over the Flames. MacKinnon was sprung loose following a nice feed from linemate Mikko Rantanen and made no mistake, firing an absolute laser beam over the glove of Mike Smith and into the top corner. With the win, the Avalanche have tied the series up at 1-1. Smith, coming off a shutout in Game 1, was sharp again for the Flames in the loss, stopping 36 shots, including a massive breakaway on Gabriel Landeskog in the first period. The Flames answered back later in the period when Sam Bennett set up Rasmussen Anderson for a highlight reel goal. With less than three minutes in regulation and Colorado’s net empty, J.T. Compher managed to tie the game at 2-2 and force the overtime frame. Flames’ Captain Mark Giordano was on the ice when MacKinnon scored his game winner and although Gio credits the Avs for executing a good play, he feels his team needs to step up their game. "We have to be better. We have to be a lot harder to play against and we know that."